Who You Gonna Call? KochBusters! Talk about the usual suspects! Lee Fang tried to make a career out of smearing the Kochs when he worked at Think Progress, but he lost his job, I suspect, when the ignorance underlying his attacks was exposed by us and others. See Contango Confusion for one famous example. 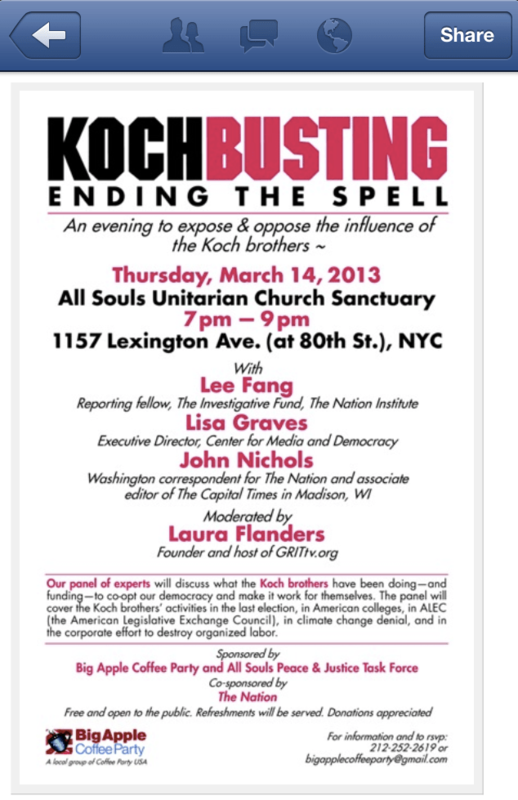 So the “panel of experts” will talk about what the Koch brothers “have been doing–and funding–to co-opt our democracy.” More accurately, you could talk about what they have been doing to participate in our democracy. Just like the people who are sponsoring this event–The Nation, America’s last Communist publication, now that the Daily Worker has bitten the dust, and the Big Apple Coffee Party, one of the more grotesque bits of astroturf on the political scene. It would be fun if some non-leftists were to show up Thursday evening and ask questions–hey, the event is open to the public and free! Questions like: who provides the money behind The Nation? And who underwrites the Coffee Party, an organization that appears to be almost completely devoid of members. And how about the “Center for Media and Democracy” and “GRITtv,” which two of the panelists represent–where do those organizations’ financial support come from? And why aren’t the people who underwrite these various far-left groups “co-opting democracy”? And if the Koch brothers are part of the “corporate effort to destroy organized labor,” as the flier says, then why does their company, Koch Industries, have such excellent relationships with the unions that represent thousands of its employees? And maybe the most important question of all: we know why the Koch brothers participate actively in public affairs. It is because they believe in free enterprise and individual freedom. Do The Nation, the Coffee Party and the Center for Media and Democracy hate the Koch brothers because those organizations, and the people who run them, believe in socialism and suppression of individual rights? That sums up The Nation’s program very well, doesn’t it? As I say, it would be entertaining to see some non-leftists attend this free event and see whether they can get answers to these and other pertinent questions.